The Fashionably-Forward Foodie: Kauai Eats! Every year, I make my rounds on the outer islands for work- Kauai, Maui and then Hilo. Although these islands are much smaller than Honolulu, I love the fact that I get to try something new each time. This time, Mom and I tried 3 different eateries, each with their own uniqueness and specialty food. But first, check out our hot ride! Thank you, Hertz, for the free upgrade!! On a foodie note, check out our eats at Deli and Bread Connection, Monico's, and lastly, Kalapaki Beach Hut! Located in the Kukui Grove Shopping Center right outside Macy's, this place is a nice stop right after hopping off the plane. 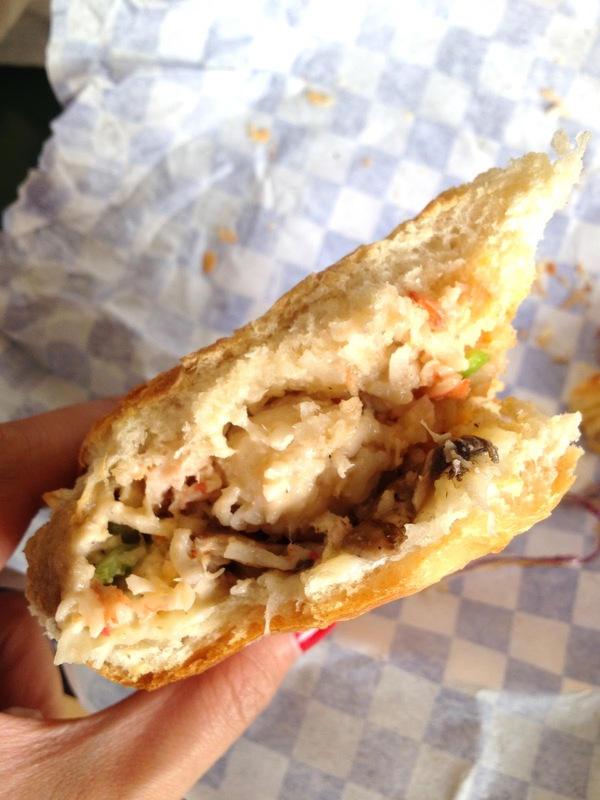 About 5 minutes away from the Lihue airport, Deli and Bread is known for their freshly-baked bread, but especially known for their famous Lobsta' Roll! Meaty, thick lobster salad (with NO mayonnaise!!) sandwiched between two hot, crispy slices of bread stuffed with red onions, mushrooms and LOTS of melting swiss cheese. What I loved was that the lobster salad wasn't drowning in mayonnaise. You could really taste the real lobster meat- no imitation! This is a MUST STOP if you're ever in Lihue. If you're not in the mood for a Lobsta' Roll, they have more than enough humorously-named sandwiches to pick from that will surely satisfy your taste buds, such as the Megladon (Philly Cheese Steak), the Carolina, Tunacado, Poor Boy, or the Vegi Burger. Or choose a Sourdough Bread Bowl filled with creamy homemade Clam Chowder. I also heard about 5 people come in and order a simple Turkey Sand to go. The bread is just amazing. Look at that Bear Claw! Mom and I really enjoy Mexican. She always reminisces about the "best" Mexican food she had while in college in the LA/Whittier area. Honolulu really has nothing that ever compares, so for dinner, I wanted to take Mom to a nice Mexican place that had rave reviews- "Verde" located in Kapaa Shopping Center. BUT, while talking to a business colleague earlier that day, he told me about Monico's. I decided to take a risk and go there instead. I had read on Yelp about getting there early, since the place is extra popular and the line can be ridiculous. After work, Mom wanted to see the rice paddies in Hanalei, so we drove for an hour to catch a glimpse. By the time we got back to Kapaa, yep, the line/wait for Monico's was long! I was ready for a tasty margarita to finish off my long work day, but realized alcoholic drinks are only served inside (and we were sitting outside)! The wait for tables inside would be more than an hour, while tables outside (in the cold!!!) were first come, first serve. We took what we could get, and hoped to just eat ASAP. About 45 minutes went by after ordering, and we were still waiting for our food. Finally, one dish came. And then 7 minutes later, our other dish came. We were absolutely starving by that time!! While Mom and I absolutely loved their Garlic Shrimp Quesadilla (and regrettably only ordered half an order as an appetizer), we were at a lost for a climax for our main entreés. Their Carnitas Burrito was just okay. Stuffed generously with crispy chunks of pork, it lacked something else. Couldn't pinpoint exactly what it was missing, but I've had better. Mom also didn't seem too excited after biting into her Fish Taquitos. She said the fish was overcooked and dry, and there was no dipping sauce of any kind. She agreed she would have liked to have a whole order of the Shrimp Quesadilla too! 1. Get there EARLY- 5-6pm should be safe. 2. Be sure to sit inside. Therefore, you can have a Margarita! 3. Sitting outside is VERY chilly. 4. You will wait for your food no matter what (Even take-out takes as long as ordering in). Service in the kitchen is slow! Dishes will come out one at a time. 5. Just order the dang Garlic Shrimp Quesadillas! They are unlike anything you have ever tasted before. Chunks of garlic, lots 'o cheese, and perfectly-cooked tender shrimp. AMAZING. First order of chips and Salsa is free. After that, you pay. BTW- the salsa with chunks of tomatoes is better than the liquid-y one. Next year, I'm checking out my first choice Mexican, Verde. We'll see how that compares! Our last Kauai foodie adventure happened at Kalapaki Beach Hut. I had finished all my work appts and boy, were we hungry! We wanted something fast and easy before hopping back on the plane. Verdict? Nothing glamorous about this place, a lot of tourists stop here for their burgers, their "amazing beach view up top" was not what you expect (small area, and tables were sticky), and their 5-fruit smoothie blended with P.O.G. (Passion-Orange-Guava) seemed like it was just a P.O.G. smoothie! Sitting area in the front. Go up the stairs for the "waterfront view"
What they're known for- their burgers and their taro fries. A little too thick for my liking, and very bland without the spicy sauce to dip. Not very crunchy either. Regular fries were better! Breakfast Sandwich on grilled wheat. Look at the un-melted cheese! Very disappointing. Also, didn't come out temperature hot. From this Kauai trip, I highly suggest stopping by Deli and Bread Connection for their unbeatable Lobsta' Roll, and secondly, Monico's juicy Garlic Shrimp Quesadilla. Those were the highlights of my trip! Enjoy!